I snapped the picture through the car window and sighed. Fourth effing ferret this week! I grabbed the purse through the open window and saw the Lovecraft book. Good Lord. Pseudo-intellectuals are entering the illegal ferret trade? With a pink purse? I slipped the little guy out of his home, removed the gold pen from his little clawed hands and gave him a popsicle stick to play with instead. I put the purse back and went over to the van. “Got another one, Luther,” I called. “Be right out!” he yelled back. 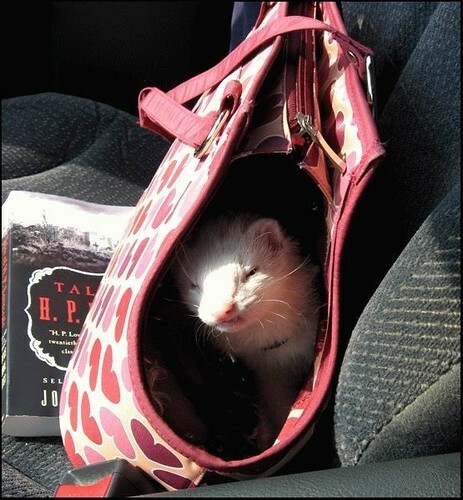 I sighed and got in the front, the ferret in my lap. His tail was flipping back and forth and he pounced on one of the buttons of my jacket. He grunted and I heard a cage door close and latch. “Yeah!” He squeezed his bulk through the door between the cab and the back and got into the driver’s seat. “Oh. You need another cage?” he asked, seeing my burden. Luther reached around for a cat carrier we had behind the seat and I lifted my little friend into it. He clutched the popsicle stick in his paws but wriggled around, sniffing everything. The minute I let him go, he tried to come back out again. “Oh no, old son, in you go,” I murmured, pushing him back. I latched the door and slid the carrier back against the side of the van where it wouldn’t move around much. Luther started the van with a rumble. One of the cats we had in the back started meowing again, piercing and lonely. I sighed and shut the door to the back. I dozed against the door until our exit. “Hey, Reece. We’re here,” Luther woke me. I pulled out the blackberry and directed him through the suburban sprawl. We ended up on a lonely road beyond the housing complexes, bounded on one side by a cornfield and the other by a cow pasture with four or five scrawny cows. We saw the rotating red lights up ahead. “They brought the van for this?” Luther blurted, seeing the big incident-control vehicle beside the road. A big policeman with a budding paunch and no-nonsense expression flagged us to one side and Luther pulled over, rolling his window down. “Luther Foxglove and Reece Martin, Greater Metro Anti-Cruelty,” Luther told him. I pulled mine out and handed it to Luther, who handed both to the policeman. He grunted and handed them back. “I’m Sergeant Black. We’ll need you in a minute,” he said and turned away. Black stopped but didn’t turn. “Bad,” he finally snapped, and kept walking. Luther turned to stare at me and I swallowed. It was a puppy mill! How bad could it be? We were finally allowed to get out of the van. The birds chirped, delirious with Spring. The breeze touched my hair, bringing a fresh smell of wet earth and growing things. It didn’t help to settle my tension. I grabbed two of the cages and Luther did the same, and we followed the silent Sergeant Black toward the big, white building just off the main road. The smell started when we were still ten feet from the building. By the time we got to the door, I wanted to go home. “Hey, Reece?” Luther said to me as we carried the fourth set of cages out of the building. It took us three more trips to get them all out. Luther and I didn’t speak when we got into the van. I reached around to the cat carrier and let the little guy out of his cage. He attacked my button again and I opened my jacket. He curled up on my stomach and fell asleep, one paw still holding the popsicle stick. What an adorable little ferret character…..I thought this was a very heart warming story.